A book chock full of information about civilian life in Winchester during the War has just been published by the Winchester-Frederick County Historical Society. The hundreds of written pages from this wartime diary have resided in the Handley Library Archives [Stewart Bell Jr. Archives Room] for many years. The stuff inside this handsome new book [653 pages worth] is incredible whether you are a genealogist or a military historian. What if I told you that the lady responsible for editing this treasure trove is in her early-nineties? Well she is. I am not sure which is more remarkable – the information in the book or the fact that Eloise Strader stuck with this editing project for more than twenty years! The end result is a handsome heavy primary source for anybody doing research about life in the lower Shenandoah Valley and Winchester during the Civil War years. Mary Charlton Greenhow Lee was born in Richmond in 1819. In 1843, she married Hugh Holmes Lee who was a prominent Winchester lawyer. He brought her to Winchester and they lived in a house at 133 North Market Street which is now Cameron Street. The house was knocked down many years ago to make room for the parking lot of the city’s most prominent 20th century hotel the George Washington. 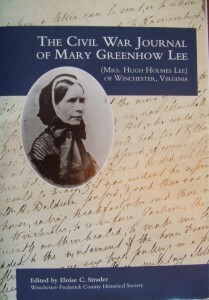 Hugh Lee died in 1856 and the arrival of war found Mary a widow with no children. She incurred the wrath of Major General Phil Sheridan in February 1865 and he dismissed her from her house and from Winchester. As persona non grata she did not return to town and eventually settled in Baltimore on November 17, 1865. This date marks the last entry in her diary. For those interested in purchasing a copy of the book please click on the below link as all sales benefit the Winchester-Frederick County Historical Society.